By Yotam Ophir Aug. 15, 2018, 11:24 a.m. Lethal infectious diseases are making headlines again, with 17 confirmed new Ebola cases reported in Congo as of August 8. The news brings back the memories of Americans’ unjustified fear during the 2014 outbreak. In any outbreak or public health crisis, health organizations such as the Centers for Disease Control and Prevention need to deliver accurate and timely information to the public about risks and treatments. For most people, this information comes mainly from the news media. But does the news provide the information the public needs during outbreaks of infectious diseases? My study suggests that probably not. Looking at the coverage of epidemics from the past few years, I found that the media often focused on what may have seemed interesting, but not what is necessary for people to make educated decisions. For example, the Zika virus poses health risks such as microcephaly, a birth defect that affects the size of a fetus’s brain. The CDC’s communications about this virus described not only official projects such as a potential Zika vaccine, but also how individuals could reduce potential harm by avoiding travel to infected areas and using mosquito repellents. Information about the latest outbreaks and how to avoid or reduce harm is abundant on the CDC’s websites and social media accounts. The agency also sends out information to practitioners to share with their patients. But most people don’t follow CDC’s Twitter account. In fact, almost half report learning about health issues from nonmedical sources, such as the news. I looked at over 5,000 news articles from leading American newspapers such as The New York Times and Wall Street Journal. The dataset included all the articles published in these newspapers on three outbreaks from the last 10 years: swine flu, Ebola, and Zika. My goal was to examine the patterns of coverage: What types of information are prominent or absent in the coverage of infectious diseases? First, I used new techniques for automated analysis of big data to identify broad categories that were used in the coverage of epidemics. I analyzed the articles from each category to see whether they included information about risk and what can be done to reduce it. My automated analysis identified three broad themes which I labeled based on manual content analysis: “scientific” information, focused on health risks and medical facts; “social” stories, dealing with the impact on markets, politics, and cultural events; and a “pandemic” theme, focused on attempts to stop diseases abroad from entering the U.S. Almost half of the coverage focused on the social consequences of diseases, such as their effect on the economy, politicians, or athletes. What’s more, I found that articles tended to focus on only one theme at a time. For example, an article about the Rio Olympics tended to deal only with social aspects. The fact that different articles focus on different aspects is not problematic by itself. People could still collect bits of information from different sources. But no matter which articles people read, there was a good chance for them to miss some important information. On average, one in five articles analyzed included any practical information about steps individuals could take to avoid infection — for example, washing hands, avoiding travel or using repellents. Those that did were largely “scientific” articles. Only about one in eight “pandemic” articles included such information. None of the 120 “social” articles included practical information. A core goal of any health communication is to give the audience a sense of control. For that to happen, people should know that there are ways for them to protect against threats, and that these ways are effective. But as my analysis showed, news coverage, especially not articles from the “scientific” theme, tended to include very little amount of such information. My study on the effects of media coverage is still ongoing, and it’s too early to reach definite conclusions. But my early analyses suggest that exposure to articles from the “social” category could lead to feelings of uncertainty, lack of perceived control and mistrust in health organizations. I found that providing audiences with articles that include information about risks and solutions, both individual and organizational, can improve people’s intention to comply with health recommendations during an epidemic. Telling people about scary diseases without informing them about ways to protect themselves is a good way to cause anxiety and emotional distress — and a bad way to build trust in government health agencies. In my view, it would be ideal if all news articles on outbreaks at least briefly mentioned or linked readers to practical information, even when discussing the nonmedical aspects of the disease. But, since changing journalistic routines is probably difficult, it’s up to health organizations and the public to fill the gaps. I hope that my work would encourage CDC and other organizations to compensate for the gaps in news coverage through their own direct communications with the public. But I also believe that the public would benefit from understanding how the media works during outbreaks. People should complement what they learn from the news with occasional visits to official websites and social media channels. It’s never too early to start. Yotam Ophir is the Joan Bossert Postdoctoral Fellow in Science Communication at the University of Pennsylvania’s Annenberg Public Policy Center. This article was originally published on The Conversation. 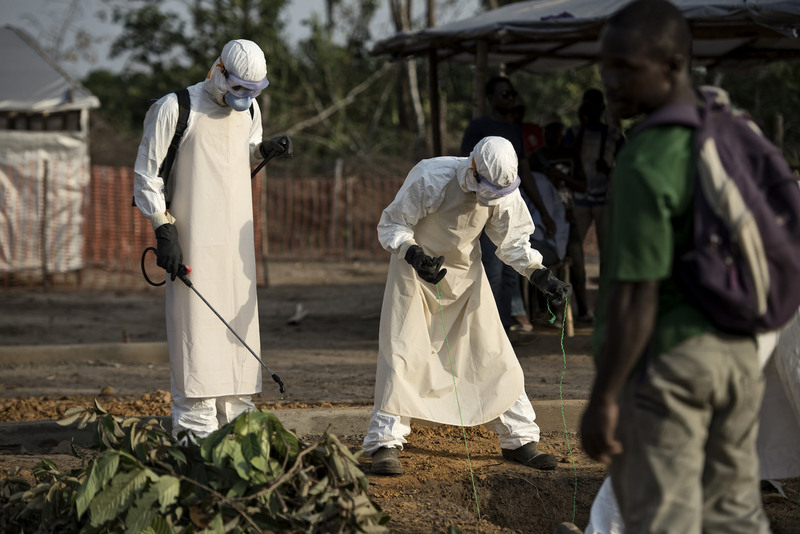 2015 photo of medical workers during Ebola recovery in Liberia by USAID used under a Creative Commons license. POSTED Aug. 15, 2018, 11:24 a.m.
Ophir, Yotam. "How media coverage of epidemics helps raise anxiety and reduce trust." Nieman Journalism Lab. Nieman Foundation for Journalism at Harvard, 15 Aug. 2018. Web. 19 Apr. 2019. Ophir, Yotam. "How media coverage of epidemics helps raise anxiety and reduce trust." Nieman Journalism Lab. Last modified August 15, 2018. Accessed April 19, 2019. https://www.niemanlab.org/2018/08/how-media-coverage-of-epidemics-helps-raise-anxiety-and-reduce-trust/.